I'll be at Cowboys Stadium today at Noon for the official unveiling of the news I told you about on Monday: AT&T Cowboys Stadium. 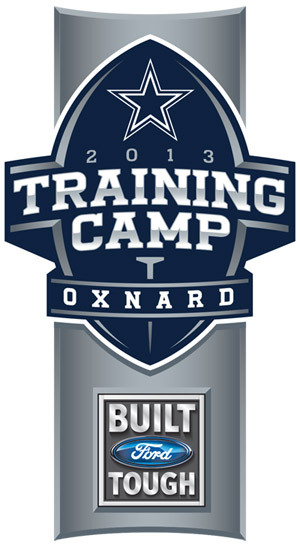 I won't make it out to Cowboys' training camp in Oxnard, California for another two weeks, but have been able to glean some info by talking to those who have seen every snap from one vantage point (scouts) or another (players) during this first week. 10. No shocker, but Dez Bryant is again stealing the show. Physically dominating cornerbacks and catching everything thrown his way. And he's even talking to the media, which is an encouraging sign of maturity and growth. 9. Because he's one of several players nursing a hamstring injury, Jeremy Parnell so far is doing nothing to push Doug Free at right tackle. 8. Coaches like new outside linebacker Justin Durant's athleticism so much that he's on the field in Nickel packages as well. 7. Among the draft picks, safety J.J. Wilcox is already turning heads and making an impact with ball-hawking aggressiveness. Cornerback B.W. Webb has been a flop. 6. Tony Romo's full of extra pounds and full of hyperbole. He told Sirius XM's Gil Brandt this week that this was the "most complete team" he's been on as a Cowboy. The '07 team won 13 games and featured 13 Pro Bowl players. Let's all just chill. 5. Most pleasant surprise of camp? Undrafted rookie receiver Eric Rogers (Cal Lutheran). Uses his big body (6-3) to shield defenders and makes catches in traffic as well as anyone on the field. 4. Even after his minor surgery, coaches are worried about the long-term condition of defensive end Anthony Spencer's knee. Should be ready for the season opener. Should. 3. No secret to when new/old defensive coordinator Monte Kiffin is pissed. Several times already he's thrown his cap to the field in disgust. 2. Biggest concern so far is the lack of depth at defensive tackle, where the temporary loss of Jay Ratliff is exposing the position. Ben Bass looks like a legit contributor, however. 1. Cowboys have called a "major business-related press conference" for Noon today at Cowboys Stadium. If you've been paying attention in here you already know what it. AT&T ring a bell? Don't forget about Bernadoodoo and Livings being hurt. Also comical this morning, and I like the guy but it's still comical: I'm listening to the Musers and they talk about the Cowboys press conference this afternoon, then I flip to the Fan during a Ticket commercial and two minutes later the breaking news sounder and Mike Fisher...The Cowboys will be announcing today at an afternoon press conference about the At&t deal...really? Horrible use of the breaking news sounder.